Hey y’all! So I posted an update on my blog entitled Devotionals. It’s beside About me, Prayer, My testimony, Home etc. A new devotional page will appear every Friday of each month. A new month brings a new topic devotional. One page of the devotional was posted last Friday. A new one will appear next Friday. In the end you will have read 4 pages (4 fridays in a month) of the topic devotional. Then a new devotional will start the next month. And remember to keep coming back each Friday for a new page! They will be listed under Devotionals on my blog. Commercialism, Cyber Monday, Black Friday, Christmas shopping, gotta get this, gotta get that, presents, toys, decor. Sadly this is what Christmas means to some people. People try on purpose to take CHRIST out of CHRISTmas. Hence the name X-mas. They just get so caught up in the “Holly Jolliness” of the season and forget all about the savior. Now don’t get me wrong I start listening to Christmas music at the end of October, Burl Ives, Bing Crosby, The Andrew Sisters, The Carpenters etc. But we always make sure to remember our king, the one Christmas is all about. I pray you do too. When I was little I would listen to my mother read it, but now that I think about it my little mind only understood it as our savior’s birth. Just a special child being born. Nothing else, nothing less. And goodness, was I mistaken. Now as I have grown it becomes more real and more understandable to me. And it is, well it’s, “WOW”. Now please stop. Get out your bible and turn to Luke 1:5-25. #1 Elizabeth and Zachariah are well advanced in years. 60-80 years old age. Now as you well know I hope people after a certain age can no longer bear children. So their dream of a child was given up on. When the angel came to Zechariah it was so hard to believe that Elizabeth would have a son. He needed more faith. #1 Mary, the mother of our Lord was only about 13-15 at the time. And she was engaged to a man named Joseph. Probably about 15 to 16 years old. Now, this was normal back then. 13 was considered to be a women, and ready for marriage. #4 Mary probably hadn’t even thought of having a child. She just wanted to get married, and let the Lord lead. #8 She was a virgin. Never had been with a man. When she asked the angel her question, and he answered, she didn’t question it, she took it by faith. My, that requires a lot of faith. This is why Jesus chose Mary. He knew she would do as he said. #9 And just thinking of someone that young having a child? The messiah? The Lord Jesus? #10 Such a big responsibility. Caring, teaching, taking care of her Lord? And a very big one: #11 Jesus was in heaven the whole time. Then God sent Jesus down from heaven in a form of a child to be born into the world. Isaiah had spoken about this long before it ever happened. #1 Joseph was probably thinking “How could she do this to me?” Broken hearted. #2 But he loved her so much that he was going to divorce her quietly, and not ruin her name. #3 When the Lord appeared to Joseph in a dream, he too did what the Lord had said. Took Mary as his wife. #4 They both had great faith. Joseph probably could have said “Lies! Look what she did. And too think I was going to marry such a women!” But he listened to the Lord. #5 They had the wedding while she was expecting. I wonder what the people thought about it. For it was against the law to have a child without being married. But they didn’t care. They loved each other and did what the Lord said. #1 When Mary visited Elizabeth and Elizabeth said “How is it the Mother of my lord should come visit me?” Mary probably had the reality sink in. She WAS the mother of Jesus. She probably cried a little. She was most likely scared, afraid, worried, but she trusted in the Lord. #2 She stayed with Elizabeth 3 months. And Elizabeth probably helped her know how to take care of a child and things like that. #3 Mary’s song was much like songs of David. Back then and today some people praise the Lord with song. And Mary did just that. #4 Elizabeth’s child leaped inside her. John the Baptist was so happy to feel Jesus’ presence. That is all we will cover today. Next week we will finish “In depth thoughts” and finish the story. 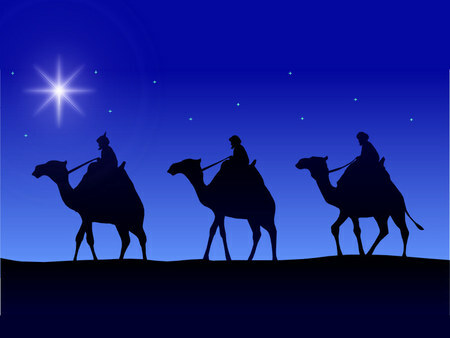 Have you ever heard the song “We three kings of orient are”? Well, we really don’t know for sure how many kings came to see baby Jesus. The bible never says. But it does say the kings brought three gifts. So,that is why people think there were three kings because there were three gifts. But, back in the bible times people did not have cars to cross the desert they had camels. Wise men and travelers usually traveled in large groups. That is how we know that there was more then one wise man. You have probably seen manger scenes where Mary, Joseph, Baby Jesus, the shepherds, and the wisemen are all together. But, the wisemen actually came to see Jesus when he was around 1-2 years old not when he was a newborn. Only the shepherds came when he was a newborn. Now, why would the wisemen present Jesus with these gifts? Why not fine jewelry, cake, or maybe a crown? They gave him gold because Gold is the gift to honor a King. It is offered in acknowledgement that Jesus is King, Prince of Peace, Lord of Lord’s etc. They gave him Frankincense because Frankincense is the incense burned in religious ceremonies. It is an offering to honor Jesus as God. They gave him myrrh because Myrrh is the oil that is used to anoint a dead body before burial. It is offered as a prophecy of the way he would die. Matthew 2: 9-10 When they had heard the king, they departed; and, lo, the star, which they saw in the east, went before them, till it came and stood over where the young child was. There is no Up on the Housetop in this story, only Away in a manger. Here are the verses that tell about Jesus’ birth. Now, his birth was no ordinary birth. An angel for-told it to a 15-16 year old girl. He was born in a stable, shepherds worshiped him. Kings brought gold, frankincense and myrrh. We ? kings of orient are.